This is a part II of a two-part interview with Moley Robotics CEO. Read Part I. Moley Robotics is crowdfunding and you have a unique opportunity to join the community of the award-winning robotic chef. Mark Oleynik is founder and CEO of Moley Robotics, the pioneering technology startup that’s bringing a fully-automated robotic kitchen to the consumer market. In this interview, Mark talks about his invention and the company he founded. What are you hoping to achieve with Moley Robotics? Our prototype Moley robotic kitchen can already cook breath-taking meals, by itself, after tracing the movements of master chefs. Now, our dream is not only to introduce the fully-automated Moley robotic kitchen into the marketplace but to bring the cost down to a point where is affordable for the middle class. I am personally entirely confident we will make this dream a reality. On the question of affordability, partly this is because, as the consumer robot market matures and competition expands, the price of the robotic parts will drop. Will anyone with a Moley kitchen be able to use it as just a regular kitchen, if they don’t want a meal cooked by the robot? Absolutely, yes. You’ll be able to use the kitchen in either its automatic or traditional setting. The advantage of such an approach is that you can prepare a dish yourself when you feel like it, or a user can record a cooking process so next time when he or she doesn’t feel like cooking, the robot can recreate the same dish itself. How about food contamination concerns, especially when the meal cooking involved raw meat or poultry? How ingredients are separated? This one is easy. The basic concept of the invention is that the machine records the motions of a human chef, then recreates them. So the robot will only do what a human chef did. The same utensil will therefore not be used twice, as long as it wasn’t used twice by the original chef. In the future, if the system detects that there is a food contamination risk, it will not allow you to record your recipe. We will have a standard food safety control procedure that will allow to detect and exclude all risks. There is one thing, however, that the robot cannot do, at least for now. It still cannot judge the freshness of ingredients. Making sure that produce is fresh and of high quality will remain, for now, the user’s responsibility. How can we ensure that the robot will clean its robotic hands? First of all, the robot will work in disposable silicon gloves. Second, we have a solution that will assure that the hands are clean. How will Moley Robotics organize technical support? Moley is a big, sophisticated robot. What if it breaks down? Robots have been on the market for many years now. True, we see few robots in consumers’ homes. But in the industrial market, in factories and manufacturing environments, robots are already widely used. There are plenty of excellent companies specializing in robotic tech support. We plan to select one of them as a partner. What is your plan for building out the library of recipes? Will you partner up with famous chefs or catering companies? We intend to work with anyone who has the desire, and the ability, to cook. Our interface for recording recipes will be friendly and easy to operate. The model that we are working on is a platform for collective creativity and knowledge. You can sell you recipes or give it away for free. If you are a talented chef what could be better than introducing your dishes to a broad audience? What is your favorite dish, and will Moley be able to cook it? I have many favorite dishes. There’s hardly time or space enough to list them all! The same dish can also be prepared very differently. We are moving towards a concept of personalized recipes and meals. You’ll be able to sample dozens of versions of the same dish, then choose which ones you want to keep in your personal library. Is Moley kitchen safe to use? This robot can not see an approaching person. What happens if kids walk into the kitchen and get into proximity with the robot? First of all, this robot is safe in usage by nature and by architecture because it just repeats the movements of a human. However, we will have the control system in place. It will not allow the software to record a recipe that could potentially cause risk. We will also install a protective screen. The robotic system is only activated if the screen is closed, and the robot will not start working if the screen is not in place. A kid will not be able to open up the screen by accident or on purpose. Kitchen’s interface will be protected by the biometric scanning system, like a fingerprint, the same way phones are unlocked our days. How will Moley Robotics organize the technical support? Moley is a big, sophisticated robot. What if something happens to the machine? A robot itself is a technology that has been on the market for many years now. We see fewer robots in consumers’ homes. But in the industrial market, robots are a widely used technology working 24/7. There are plenty of excellent companies specializing in robotic tech support, and we will work with one of those. Michael Pollan says in his books and his latest Netflix documentaries that cooking is what made us human. Moley is taking this away from us. What do you have to say about this? This logic is a total misunderstanding of the concept of what Moley can do. Moley does not take away the knowledge and the ability of people to cook. On the contrary. Moley accumulates human knowledge. If you cook something truly unique, the robot will record the recipe precisely, and it will keep it for future generations to reproduce. If Moley goes to the restaurant business, this will leave people out of jobs? Sous-chefs, line cooks, prep cooks, dishwashers, etc? This is the kind of comments that show us on Moley’s social networks right next to comments about how amazing this invention is. Moley opens up room for creativity at each of those sectors. If primary tasks are taken care of, then chefs can concentrate on bigger issues. Creation of new meals, or discovering technology of cooking of long-forgotten dishes from centuries ago. Today we see a peak of virtual optimisation. Services such as e-commerce, logistics, database, and cloud services made everyone’s lives easier. Before the automation people were performing all these tasks and often making many mistakes while doing it. I don’t think that plant workers moving product from one line to another were happy, it was just a way to make money. And it was a very low paid job, too. Machines can do borings tasks 24/7, and without making mistakes. Automated productions prove that robots and AI make such tasks better without taking time off for lunches and weekends. The unique quality of humans is that they can create new models for themselves because only people understand what they want. If you think that we will see times when robots can predict human wishes,you are fooling yourselves. The robot can’t learn to interpret if the result will be satisfactory for a person. The creative process is human’s territory. In the future, humans will not have to perform tedious tasks. This time can be used instead to compose music, write books, spend time with family, think and create something new. What are the developments in the company in the last year? On R&D level, we finished work on product’s architecture and product pack specifications. We completed the visual version of the model which requires completing a big number of tests of the technology in the simulation mode. We created the data exchange protocol and made the final database for that data. We signed some licensing agreements for the technologies that we will use in the development. We completed negotiations with large technological partners who will be creating parts of the product for us. On a corporate level, we finished working on the final version of the business plan and business model. We came up with the strategic plans for the company development, and we expanded our team. A lot of work was done to move us closer to creating the final product. Why crowdfunding? Why not reach out to private investors? Crowdfunding is just one of the funding solutions we are exploring. We are well suited to go crowdfunding for the first round of public funding. The robotic kitchen is a consumer market product. Any consumer oriented products are quite successful in the crowdfunding world. When companies work on a technology that does not necessarily face the customer, they are more effective working with the institutional investors. We are a B2C product, which means we have a broad range of opportunities for working with wide range of investors. We want our investors to be active and involved in the business and development to the extent they wish to do so. This involvement could include testing, providing ideas and recipes and helping deliver the best possible cooking solution to the market. Europe at this point. We understand the european market, its capacity, and preferences. The USA is our next step. Should people believe in Moley’s success? Model is ideal. There is no way to come up with better technology to resolve this particular task. What kind of benefits investors will enjoy? How quickly can you scale Moley? In the next 12 months, Moley plans to re-engineer and integrate the Moley Kitchen design and components, including the robotics, the controls, and the cabinetry, with the focus on building precise, low-cost, safe technology. In parallel with this, we plan to develop the necessary partner relationships for sales and marketing, and ingredients supply, and create the first recipes, all to be in place for the product launch. 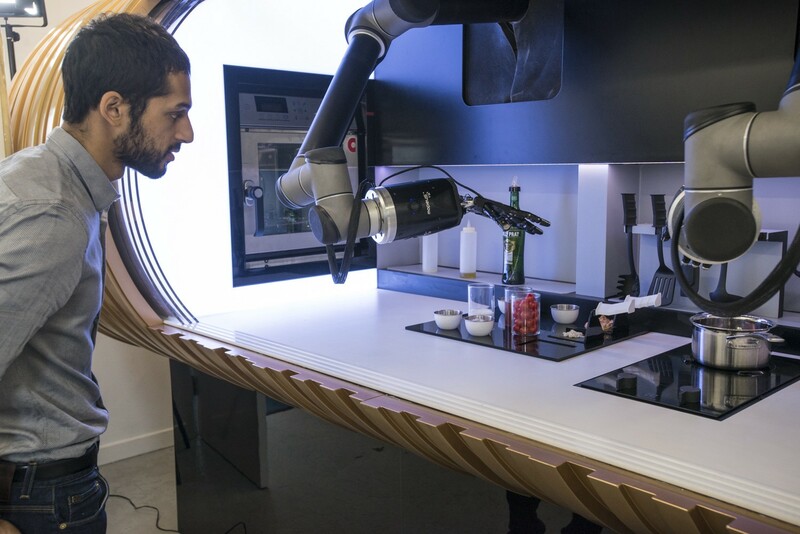 Meet Moley, The World’s First Kitchen with a Robot Chef. Moley Robotics is a company that builds kitchen units with a robot that cooks food for you at home.